Discussion in '1940' started by fenifur, May 10, 2012. My Great Uncle, Stanley Ellis, was a Corporal in the King's Own Royal Regiment (Lancaster) and died around the 26th May at Dunkirk. I know it's a bit much to hope that someone from that regiment will still be around AND a member of this website, but I mostly just wanted to find out what would have happened to his body, would it have been brought back? I know this regiment was the last to leave Ypres, so would he be buried there? If anyone does have any more info on this regiment it would of course be gratefully received, although I'm not even sure how long he was with them as he enlisted in the Queen's Royal Regiment (West Surrey). Corporal Ellis is buried in Merville War Cemetery. As to the regiment, five battalions of the King's Own served with the BEF in 1940. Corporal Ellis was with the 6th Battalion, which served with I Corps in the pioneer (labor) role. Like other such units, the 6th was pressed into combat duty during the German May offensive and fought a successful rear guard action at Merville. The official history by L.F. Ellis mentions the unit here: HyperWar: The War in France and Flanders 1939–1940 [Chapter XI] Your relative was apparently one of the casualties of this action. If you want more information, try the PRO. They should have the unit war diary. Good luck in your search. The PRO catalogue number for the 6th King's Own war diary is WO 167/767. Contact Drew 5233 on this site, I believe he may have a downloadable copy of it. Meanwhile enemy tanks and infantry passed between Robecq and St Venant to attack Merville. They made repeated attempts to capture the southern bridge leading into the town, but the 6th King's Own (a pioneer battalion) with the help of a single field gun defeated all their efforts, captured twenty prisoners, and destroyed two armoured cars and three tanks. During the night the garrison was reinforced by a troop of the 10th Field Regiment and two guns of the 115th Army Field Regiment. I'll post more from the unit's diary when I get home. Corporal Ellis was with the 6th Battalion, which served with I Corps in the pioneer (labor) role. One of the BEF's "digging" Battalions, I presume, and eventually pressed into a role it was nowhere near prepared for. 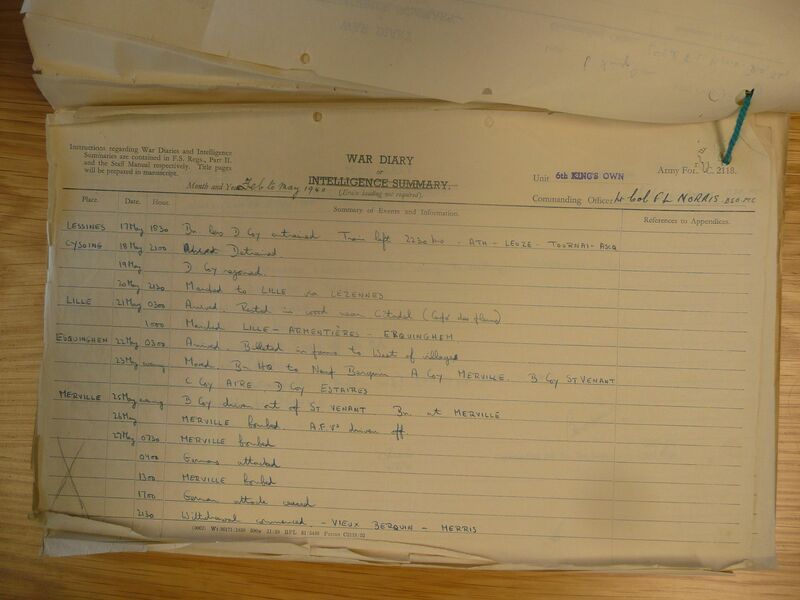 It's worth pointing out that there is a hand written note on the front of the file cover refering you a an interview of detailed accounts covering the 23rd May to June in Major Jolsens interview book at the National Archives. It will be sometime before I get to copy the book but I'm happy to give you the file ref number if you can get to Kew. I was just doing some research for my Grandson who is doing a project at school and came across this very interesting site. My father, Reginald Walter Fennings was a Lance Corporal in 6th Bn. He was captured at Merville on 29.05.40 defending the bridge from advancing Germans. He was then marched to Poland I believe and spent the rest of the war in Stalags 8b and 8c. His war records state that he was wounded believed missing and it was only known that he was alive in October that year. He didn't speak of his experiences much but I do remember him telling me that the Germans treated them very badly and he lived mainly on black bread and water and any scraps they could find. One time he was put to work in a coal mine. Conditions were so bad that he deliberately put his hand in a machine so that he could get some respite in hospital until it had healed. He learned German and was given the job as a signwriter as he was quite artistic. When working on a German Officers room, he was told to sweep the room. He refused and stood in front of the officer telling him to shoot him if he didn't like it. The gun was draw and pointed at his head but not fired. My father passed away in 1982 after a long illness. I hope this information helps you . The references for the diary would be brilliant, I've been meaning to get to Kew for a while now, although I don't think I'll be able to afford it until next year. It seems he just escaped getting captured, as by the diary it seems he died in the bombing on the 26th May. Keith - it's strange to think they would almost certainly have known each other Until now we didn't even know where he was buried, it's such a shame that many memories will go unheard, but then they are often unpleasant ones. I now have the Regiments history-check in again on Sunday eve and I'll have some more info for you, hopefully. Hello Fleetboy46, or should I say Keith. I came across your post above whilst looking for information on my 1st cousin 1x removed, ie your father Reginald Fennings. He was a 1st cousin of my mother, Dorothy Margaret Studerus (nee Collier). I was working from a newspaper cutting from my mother's archives, which reported your father's death and gave outline details that are very similar to those that you report in your post. I know that your post was placed some time ago but, in the hope that you see this, please get in touch by email.